Blackjack never stops its development: blackjack players continue to create and develop new variants of this card game in order to try something new in the world of blackjack. Slight rules differences make these blackjack variations unique and very interesting to try. You are welcome to read short reviews of the most popular blackjack games and choose the best one for yourself. It is never late to try something new, isn't it? This is the British variant of blackjack. Though the object is the same, it must be remembered that blackjack pontoon does not have any official rules (every casino has a right to set its own rules for this game). Pontoon has become very popular at the beginning of the 20th century, and today it is possible to play both online or in European casinos. Usually, 5-8 players sit at the table when they play Pontoon: 1 deck of cards can be used for this game (or 2 - if a number of gamblers is more than 8), but usually Pontoon is played with 8 decks of 52 cards. This blackjack variation is rather young as it was created in 1995 by one casino employee. It is called to be Spanish because a such-called Spanish deck of cards is used for this game: 10's are missed there, so there are only 48 cards in a deck. According to this, the rules of Spanish 21 had been changed a bit in order to give advantage to players, so, it was not surprise that this blackjack variation became more and more popular. 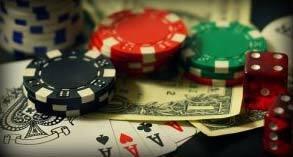 Today, blackjack tournaments take place where participants play Spanish 21; strategies had been developed for this game and books had been written which described the principles of Spanish 21. This blackjack variation is impossible to play without the option of splitting, so, if you like it - this game will definitely be your favorite one! You play Blackjack Switch with two hands of cards here, so, you have more chances for winning as a result! Do not forget to place equal bets for both your hands! The interesting thing is you can switch 2 initial cards of your hands: though it seems to be rather easy, special strategies concerning this step exist and they are not very easy to describe. This blackjack game is played in many Las Vegas Casinos: it has got its name from Vegas Boulevard - Vegas Strip - where all gamblers can find a lot of casinos. If you want to play Vegas Strip, learn the blackjack rules first because this game does not differ much from conventional blackjack though has something to surprise you with. First of all, you must know that Vegas Strip is played with only 4 decks of cards and a player has a right to split Aces only ONCE here! If you split Aces you can receive one more card and you do not have a right to double after splitting. Also, you lose your insurance if you split cards. This blackjack variation is very easy and exciting to play: it gives a player one more chance for winning. It is played both online and in land-based casinos; 6 decks of cards are used for perfect pairs though some online casinos do that with 4 decks. This game is almost the same with Vegas Strip but it gives you one more bet option: it will win if two cards of your initial bet will be a pair (two 10's or two Jacks for example). But the object is the same with classical blackjack: to beat a dealer without exceeding 21 points!